This DVD documentary looks at the Precession of the Equinoxes. This subject has been popular among alternative science researchers for many years, and much of the material covered in this excellent film summarises the debate between the academic quarter and the popular science writers. 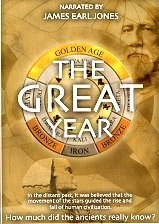 'The Great Year' then moves on to try and explain why precession exists at all, and presents a radical new theory. The Earth's movement through space is highly complex. It spins erratically, its tilt with respect to the plane of the ecliptic varies, and its orbital eccentricity changes over time. Most scientists would see little in the way of mystery here; it's just the physical properties of the Earth's orbit and spin. But some have pondered the question of the Earth's wobble which occurs over a 24,000 yr period or so. Walter Cruttenden considers it to be due to the Sun's movement through the heavens, rather than the Earth's. Quixotically, this is almost returning to a geocentric vision of astronomy, but with the addition of one major factor; a binary star. Cruttenden argues that the influence of this star is substantial enough to cause the Sun to rotate around a common centre of gravity between itself and the binary companion. This stellar dance through space then creates the effect of precession for an observer on Earth over the course of thousands of years. The DVD does a great job in putting the complexities of this idea across. It's not particularly easy material to digest if you're unfamiliar with the concept of precession. It certainly helps to see how it works through computer animation. But this DVD goes beyond simple computer graphics. It is beautifully presented, well written, and intelligently put together. The DVD is also narrated by James Earl Jones, which provides atmosphere and a very professional overall feel. However, the argument is too one-sided at times, lacking any sceptical appraisal or counter-point. This is despite a fairly stellar cast of researchers. The computer animations of the Sun and binary companion orbiting around each other are also way beyond anything resembling reality; at best the Sun could only be orbiting around a binary centre of gravity which is itself embedded within the Sun's bulk. Such is the immense mass of the Sun compared to any possible binary object. Indeed, the idea that precession can be linked to the existence of a binary companion suffers a further, fatal flaw, which I have outlined in my book 'The Dark Star'. Suffice it to say that, although I myself advocate the existence of a Dark Star, I don't subscribe to the opinion that it can account for precession. It is simply too small and too distant to affect the Sun in the way proposed by Walter Cruttenden. That disagreement aside, I think it's fair to acknowledge that this DVD is absolutely top quality, and I would wholeheartedly recommend it to anyone interested in ancient mysteries and archeo-astronomy.